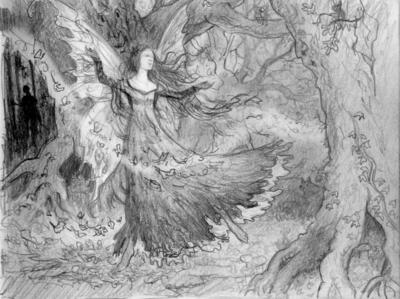 i have been iterested with fairies because you no there fairies there just so pretty.but i saw this one in my dream which was kind of crazy. i went to a dream interprator ang asked her about it.before i left i skeched the fairy and she told me that my imagination was so amazing and creative. she told me my dream was about how im going to have a once in a life time chance and that i will make a discovery.it hasnt happened yet but you no life takes time and being 14 theres a lot of time on my hands.on the other hand your drawlings are amazing and when im older i wish to be an artist/potographer.